The packaging of the Blushes. I love blushes that comes with mirrors! They come with a brush too but they aren't soft at all. These would be the colors of the blushes. These photos are very true to the actual colours. Please take the cheek rouge with the brush and then paint it on your cheek. Attention of the use: If something happen the trouble on your skin using them, please stop use them. I wasn't anticipating on these blushes because I'm a brand freak when it comes to make up and skincare. I mean, how are you sure that the stuff they put in to produce this product is safe? Anyway, I decided to look into these blushes despite all the negativity in my head. Color payoff is great. They are pigmented but they aren't bold, you can build the colors onto your cheeks. They are also extremely easy to blend as well. 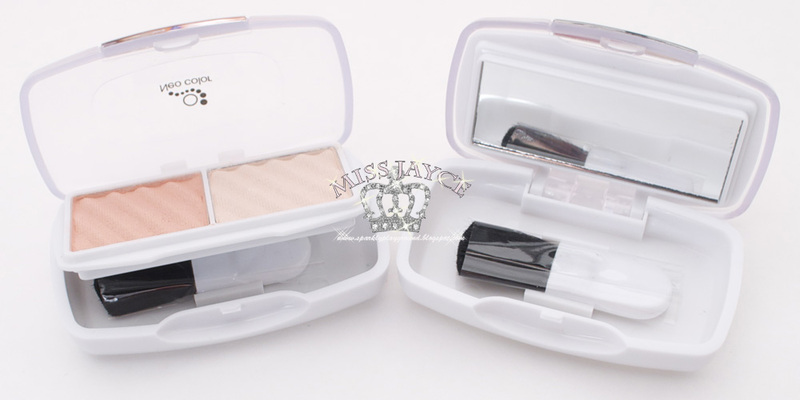 I enjoyed how it comes in a duo compact, one being the blush while the lighter colour can be the highlight. The colors aren't matte and has shimmers. I really enjoy the color because it gives off a healthy glow instead of being over shiny. The lasting power is good, I didn't have to touch up too much. Only about twice during the day. Overall, I'm satisfied with these blushes. I don't regret spending money on these. Though, I still remain "iffy" because I'm unsure of the ingredients. Otherwise, these blushes preform exactly the way they should be. I do advise they look into the brush and the English translations, it's quite ridiculous and unprofessional. Price: 5/5 ♥ $2 CAD plus Vancouver's Sales tax. Very Affordable. Doesn't hurt to stock up! I'm recently trying to do some Daiso reviews because I remember there were requests on them from the Daiso Haul. I have their Mask and Eyelashes up next, if there's anything in particular you would like to see a review on, please request in the Daiso Haul Post Here. Thank you! !